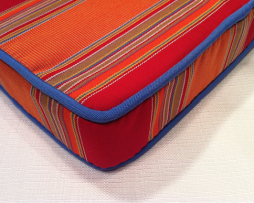 Custom Sunbrella outdoor cushions are made in the USA. Durable, elegant and individually tailored to your specifications and style. Get an instant price by entering a few simple measurements. Perfect for ycustom bench, wicker, chaise lounge, window seat or chair cushions that will be made from USA woven Sunbrella faoutdoor fabric. 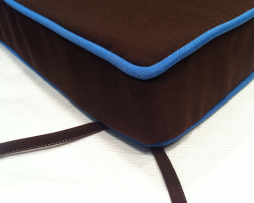 We also make replacement cushions or seating for custom furniture, as well as any size cushion that comes with a zipper and the foam is Dacron wrapped to give it plushness and form.